Bounsang Khamkeo is a strikingly strong man. His small frame and gentle nature is not to be confused with physical strength. It is his character, forged from years of suffering under a brutal regime and prison sentence, that tempered his prowess to push forward his dream for a free and democratic Laos. Bounsang Khamkeo with Portland's "Allow Me"
There is an exceptional calm that emanates from Bounsang Khamkeo, author of I Little Slave: A Prison Memoir from Communist Laos. For the hundreds of frustrated, angry and emotionally-charged individuals he sees in his work as a behavioral health counselor, Khamkeo’s warm voice is a sanctuary. His voice reaches out to others in many languages. He can speak Chinese (Mandarin, Cantonese and Hakka), along with Vietnamese, Thai, Laotian, French, and English. The languages are the tools he uses to convey wisdom and guidance to his clients for healing and recovery. Khamkeo’s clients do not know of the physical and psychological tortures he endured in Laos’s slow death camps, a country with one political communist party and a long history of intolerance toward dissident. There are no noticeable indications that point to his past suffering. His clients only see a dedicated, gentle man. Khamkeo’s focus is on his clients’ well-being. He offers an environment where their lives are paramount. In many cases, it is the only such place for the individuals who walk through his door. In his counseling sessions with his clients, Khamkeo understands the pain and thinking that hinder healing. He explains how their experiences and problems are not karma or retribution. He offers them a new way of thinking with a way toward recovery. Khamkeo specializes with immigrant and refugee clients from Asia at the Avel Gordly Center for Healing with the Oregon Health and Science University (OHSU) in Portland, Ore., who suffer from substance addictions. The causes and effects are numerous. Unemployment, loss of family members, a lack of English language skills, trauma, cultural adaptation and depression are some of the precursors of their addictions. Khamkeo patiently guides them through a personal journey to find peace within themselves. His talents and skills bridge many worlds for individuals who would otherwise find it difficult to communicate both linguistically and culturally with others. It is an unlikely occupation for a Laotian who studied in France and received a doctorate in political science at the University of Toulouse. Khamkeo returned to his country in 1973 to witness its plunge into political chaos after the signature of the Paris Peace Accord to end the Vietnam War. He worked for the coalition Laotian government until the Lao People’s Democratic Republic or Pathet Lao (Laos) communists took over the country in 1975. Khamkeo was appointed to the office of Executive Secretary of the Laotian Mekong Committee in 1978. At that time Laos, Thailand, and Vietnam established the Interim Mekong Committee to promote the development of agriculture and fish farming, improve navigation routes along rivers and construct hydroelectric dams along the Mekong River. It was a high level position. Khamkeo said he was surprised to be promoted to such a responsibility because he was not pro-communist. However, Khamkeo accepted the role and the duties it required. In his position, Khamkeo worked to get financial help from the outside world. The country was in economic ruin after the war. Any alliance that would facilitate an influx of capital was considered important by the government, even if it meant working with capitalists. The Mekong Committee was an inter-governmental regional organization that worked with UN Development Program (UNDP), regional international organizations, and donor countries. International investments and support were nearly nonexistent in the post-war era of the nation, so international ties were deemed necessary to carry on the government’s development objectives. Khamkeo’s role involved many duties that would confuse Westerners. Service to the government meant performing all duties required by the Party. Laos was a country where no one dare question the authority of the communist Party. As a high-ranking government official, Khamkeo had to clean his office building, sweep the street and work at his office’s vegetable garden to prove he was not a “bourgeois or a reactionary.” It was normal to conduct oneself under such dual parameters. Before the regime change, Laotian society was built upon politeness which deferred to the higher position with the phrase, “I Little Slave” instead of “I.” Khamkeo would soon discover the consequences of that traditional ideal when he was put in prison by his new communist masters. On June 1, 1981, Khamkeo entered Red Cliff Reeducation Camp after running afoul of an ambitious boss. It was one of the most brutal prisons set up in Laos to punish people who dared to stand up to the Party. The Party referred to its prisons as seminar centers or reeducation camps. Khamkeo would not participate in the corruption that ran rampant throughout the government. It was actually a natural reaction on his part. Khamkeo wasn’t a whistle-blower who opened up public scrutiny on government corruption. There was little to no opportunity to achieve such grand actions. He plainly would not defer to his boss’s demand of cronyism. His simple defiance was cause enough to send him away to prison in the jungle. In 1981, such a single act was considered a crime. The expectation to serve the Party was absolute. It still pervades Laotian society today. Even with some recent improvements, Laos continues to place near the bottom of Transparency International’s list of worst corrupt states in the world. That day, Khamkeo lost everything except his humanity and dignity. Time had stopped. There was no future to contemplate, only the present moment in which to survive. Khamkeo recalled gazing at his young daughter, Vilaihak, in her crib hours before he was taken and vowed to survive for his family. His vow would mean suffering inhumane circumstances with little hope of ever escaping. He vowed to live despite what he would face. It was a commitment that reached beyond any obligation the Party had demanded. It was the only human act in Khamkeo’s control. It carried more weight than any policy or ideal. But that one act and the commitment to not “confess a sin” for the Party meant seven years and four months of brutal consequences. There was little known of what happened inside Laos’s prisons in the 1980s. It was kept secret and for good reason. The abuse, torture and abject violation of every human right would have enlisted an international outcry. The system just disappeared those entering into its dark abyss. It was a conscientious effort of the Party in a physical and psychological level. It used both to destroy those inside its walls. “They [the prison guards] tortured me,” Khamkeo told a riveted audience of his medical peers at OHSU’s monthly forum in August. “I was in handcuffs for one and a half years and could not take a shower. It was not allowed. There was no medical care. I had several serious sicknesses. I am lucky to be alive.” Khamkeo described how the psychological effects added to his pain. “There was no contact with family,” he said. “They prevented me from sleeping for several nights.” He told how the guards had tied a rope around his neck and attached it to the handle of the door of his solitary cell so they could pull on it and choke him if he nodded off to sleep. “They would pull on the rope and ask, ‘Are you still there?’ all the time.” Khamkeo recalled Nazis who used this torture technique to disturb their prisoners from sleep before interrogating them. The vivid accounts of his time inside the Laotian prison system are vividly documented in his book. Khamkeo published the book in 2006 years after he arrived in the U.S., and after a translation from the original French to English. The book is a culmination of his efforts to personally heal and offer help to others. One of his colleagues questioned if the book could be used to help people with post traumatic stress disorder (PTSD). Khamkeo replied, “Yes, I have a few former military clients from the Vietnam War era in counseling. I teach them how suffering can make them strong. They have a choice about how they want see the world and build a new life for themselves out of their pain and hurt.” Another question asked if he believed there was just plain evil in the world. Khamkeo told the audience that in the Chinese philosophy of yin and yang, there is good and bad together, but he believed in good people. It was a short answer to a profound question, but Khamkeo answered much more in detail by being in front of the podium with no embedded hate or anger. If anything, he proved there is also just plain simple goodness. 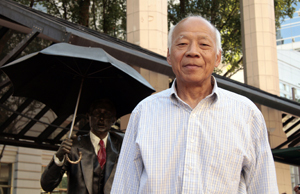 During an interview inside a Starbucks at Pioneer Square in downtown Portland, Khamkeo expressed his hope for what the book can do for many others. He chose Portland’s most popular public space as it is always bustling with lots of people. He wanted his photo taken with Portland’s iconic statue, “Allow Me,” a life-sized bronze man with an umbrella created by Seward Johnson. His book is not only about his own suffering but also about universal suffering. Khamkeo said inside the coffee shop, “We know that war and torture have existed for thousand years on earth. The human condition is suffering, nothing is new under the sun. Today we see the same suffering in many countries where war takes place. Tomorrow we will see suffering again, only the form of suffering maybe different.” After a pause, he added, “But we should try to stop violence.” Khamkeo described feeling his own suffering mingle and fuse with that of the whole world when he realized how destructive suffering continues to be for the world. Khamkeo was constantly harassed to provide a confession that he was an “enemy of the Socialist state.” He explained, “It was very dangerous. They want it in writing. If I said ‘yes,’ they would kill me. If I said ‘no,’ they would keep me forever.” Khamkeo said he determined he would be honest to himself, so he refused to comply with the order. Life in the camp was a vicious cycle of abuse for each prisoner. Khamkeo described how he witnessed death continuously. “They often pulled prisoners out to shoot them,” he said. “I never knew if I would be pulled out next.” He thought about death and suicide for many years. The silent killers at the camp were the mosquitoes that carried malaria and the harsh winters with no protection or warmth. Khamkeo survived several near-death illnesses. Khamkeo’s life-changing moment came through a sequence of events one day during the rainy season at Red Cliff. He read a certain section of his book to illustrate the moment. The words were carefully and eloquently chosen. He did not wish to risk the story being told any other way. The passage is not located at the end of the book, but rather in the middle of his most horrific ordeal. The experience helped him reach beyond his ordeal in many ways. It also gave him hope. On certain days, Khamkeo and the other prisoners were forced to remain in their barracks. The facility amounted to no more than straw and tin, but it was enough to keep them in place. One lonely day they listened to a man singing some songs. He had proudly created a makeshift guitar out of a candy box and wire. The first song was a song dedicated to the glory of the Party, which drew criticism from one of the inmates. He then changed to a rendition of “Jail House Rock” with his makeshift stringed instrument. Some prisoners joyfully joined in the song. The “Master Chanthone the Cruel,” a name well-deserved according to Khamkeo, unleashed his anger over such an act, yelling it was forbidden to sing an “imperialist” song and to have fun in prison. He threatened to shoot whoever had the instrument and the frightened owner of the instrument confessed. The prison guard smashed the makeshift guitar as a storm erupted overhead. The prisoner only lost his instrument that day. Khamkeo’s present demeanor is not a covering of the pain, but a genuine freedom from it. He hopes his book and his public story will help open the doors to freedom in his country and heal the pain of so many who have experienced oppression and fear. One day at Red Cliff, a voice came over the loud speaker announcing the date. Time was not measured by days at Red Cliff so any acknowledgment of a date was an ominous warning. The deputy prison chief told the prisoners it was September 26, 1984. They were all told that trials would be held, and they would be freed. The voice said to pack their bags, but only what they could carry. Like everything in the prison camps and system that ran them, Khamkeo knew the announcement was a ruse to get the prisoners to voluntarily assemble themselves for what was coming next. It was not freedom. “There are no lawyers, no appeals. In a communist country citizens don’t need lawyers because it is a classless society,” Khamkeo said in a sarcastic tone that was required to recite again and again in Laos. He said once someone was sent to prison there was no way out, otherwise it would look like the Party was wrong and the Party could not commit wrongdoing. He shuddered when his name was called. He packed. Sop Hao prison made even the most hardy prisoner at Red Cliff cringe. It is an amalgamation of slave labor and death camp for Laos’s detention system. Located between the Nam Ma River and the border of Vietnam, its isolation guarantees the prisoners are far removed from any civilization. The Party wanted no reminders of them. Khamkeo and 59 others discovered what that meant when they arrived at Sop Hao prison. Upon their arrival, they watched an emaciated man beg a guard to kill him. Khamkeo recalls what the guard said, “I don’t need to kill you. You can die here all on your own, slowly.” It was a pervasive tactic of policies that stripped away human rights and dignity. It offered the Party an excuse that it was not directly responsible for the deaths in such places. Khamkeo experienced how cruel such conditions were for those suffering within its grip. The man who had studied the world’s political systems would never give way to communism again. He vowed to tell the truth to the world if he survived. After more than three years at Sop Hao prison where a great number of prisoners died from execution, overwork, disease, and starvation, Khamkeo managed to survive. When Khamkeo first learned of his release in September, 1988, he was not prepared to be a witness. All he wanted was to see his family. He traded his shirt for some pears, a symbol of hope to present to his family. He said the reunion was a poignant reminder that love can work through any hardship. His wife, Vieng, who struggled to raise four children in his absence, though his two sons Vannasack and Aloun eventually fled to a Thai refugee camp, greeted him with the deep love that she held onto each day he was gone. It was a most victorious and happy reunion for Khamkeo. He had conquered all of the government’s attempts to break him. The perestroika policies of the former Soviet Union unleashed a rush of change across the borders of many countries in the communist bloc. Laos’ leaders decided to free some of its political prisoners in a show of mutual agreement. Khamkeo’s release certificate was stamped on September 6, 1988, with no charges against him. He used the official document as a cover for his book. It serves as a poignant reminder to Khamkeo of a system with no logic or rights. His surprise release was welcomed, but he was still in Laos with little hope of a future. Khamkeo’s sudden release from Laotian Goulag did not guarantee him a safe life at home. His ambitious former boss continued to harass him. His life was becoming more unstable for him outside the prison walls. He and Vieng determined it was wise to escape before he was drawn into another false accusation. He would have to leave behind family, friends, and his bitterness. He was going to start a new life. “Time to forget the past,” he said. “It is time to think ahead.” Khamkeo details in his book how his two sons left first for California from Thailand. He, his wife and two daughters, Palavi and Vilaihak, arrived in the U.S. in May, 1989, to settle in Murfreesboro, Tennessee. His wife’s niece and her husband sponsored the family. One month later, he and his wife were able to fly to California to pick up their sons. The first year was a new beginning for the family, but Khamkeo could not find a job. He decided to begin writing his memories of prison experience so he would not forget any detail. He naturally wrote in French, as he knew little English at that time. He completed the manuscript, then moved to Maryland to look for work. He was still unable to find a employment. Fortunately, a Laotian friend in Vancouver, Washington, invited the couple to the city for a possible job. The couple arrived, liked the region and sent back for their children. Their friend helped Khamkeo land a job as teacher’s aid for English as Second Language (ESL) students at Fort Vancouver High School. After several months, another local Laotian heard of Khamkeo’s manuscript and wanted to read it. He did, then gave it to Laurie Moore, a doctor at OHSU. She worked with the Indochinese Psychiatric Program. Moore was so taken by the story that she offered to help translate it for Khamkeo. Her duties at the clinic proved too much to complete the task, but she offered something better, a job using Khamkeo’s manuscript for his resume. Khamkeo recalls that Moore determined that his experience and education could qualify him as a behavioral health counselor. He was offered the position after some training. It was the first time in many years that Khamkeo made a decision about his life that was not tied to survival. He decided that he wanted to help and serve his community, so he accepted. Khamkeo said he discovered something important about his book. “Since this country gave me a place to live, I needed to give back to America by publishing this book here,” said Khamkeo. Then he took English classes to prepare to rewrite the manuscript. His academic colleagues at Fort Vancouver, Dorothy Parkin and Suzanne Mayr, helped him complete the manuscript. Khamkeo believes education and work in politics affords him an insight of where best to place diplomatic efforts. His dream is to see a multi-party system in Laos someday He thinks the U.S. has an important role to play. He pointed to Laos helping the U.S. against Hanoi during the Vietnam War. “Laos and U.S. had a close relationship. The relationship involved CIA advisers assisting the Royal Laotian army with plain-clothes military pilots flying secret missions inside its borders to counter North Vietnamese troops during the Vietnam War.” The U.S. re-established full diplomatic relations with Laos and granted it Normal Trade Relations status in 2004. Khamkeo feels it is dangerous to support economic growth without pushing for human rights. “On the surface, Laotian people can travel freely and do private business. In reality, no criticizing the Party line is allowed,” he said. “So how can Laos be a free country?” President Barack Obama recently lifted Laos from the U.S. trade blacklist citing “Laos is no longer a Marxist-Leninist nation.” The country remains one of the few lasting Communist countries. Human rights are first on Khamkeo’s list of changes that need to happen in his homeland. “Human rights issues are a priority,” he said. “First, the Laotian government must free all political prisoners.” He hopes that freedom of religion, press and association will come soon as well. Khamkeo addressed the human rights issues of Laos before the Belgium Parliament in May at the International Committee for Democracy in Laos meeting. He articulated the need for supporting human rights and democracy in the country with international pressures. Khamkeo believes no change can come if Vietnam retains its influence over the Laotian government. The Vietnamese government announced construction of a security office in Vientiane in August. The Vietnamese minister of public security, Le Hong Anh, credited the facility as part of the special relations between the two nations and police forces. The terminology reverts back to the 1977 when the two nations signed their first 25-year Treaty of Friendship and Cooperation. Khamkeo fears such alliances will further destroy any chance of independence for Laos. He hopes the younger educated generation will begin create the changes, but fears that government control will stifle any popular movement. “The younger educated generation wants change. It sees the world through the internet. Party always praises its way of governing is democratic, but the younger generation sees it differently, and it is afraid to say anything.” When asked what scares them the most, Khamkeo immediately responded, “The secret police go after the entire family. They go in to check the entire family. Even exiled Laotians who come back to visit, they are afraid to voice their opinions that would be cause for arrest. Everyone is watched. Their phone calls and letters are monitored. Their internet viewing is tracked and disrupted. The media is strictly controlled. “We can call family from America and friends in Laos, but we all know someone is listening.” Now they can listen in with Laos’ first 3G generation of mobile technology.